Aint' no party like the No Coast party! If you're sick of being cooped up in this weather, let your car warm up, and then head downtown to the Midtown Global building for the 2013 No Coast Holiday Craft-O-Rama! Read more about Aint' no party like the No Coast party! I'm Here! And Chessie Peaks! Yup! I'm still here, and so, finally, is summer! Happy Summer Solstice to you all! Ours has been a warm, humid day book-ended with fairly severe thunderstorms, leaving the ground completely soaked and covered in tree debris. Since my last post, the school year has ended so the kids are home all day, I turned 37, and we've spent three lovely weekends at the family cabin. Read more about I'm Here! And Chessie Peaks! It's finally Spring in Minnesota! With snow still falling in early May, and June high temps in the 50's, we weren't sure this season would ever take off, but it's getting there, and the birds are rocking the chilly breezes with their calls and are busy collecting materials for their nests. While these birdies are doing their nesting work, I've been working on some nesting-related things of my own: Nesting Dolls! All Things Paper -- in print! If you're a fan of papery goodness like I am, there's a good chance you already know about a gorgeous blog called All Things Paper. It's written by one of the nicest people I know, Ann Martin. Ann is an accomplished quiller and blogger, and consistently fills her site with anything and everything to do with paper arts. If all of this is old news to you, you have also likely heard about a new book that's currently available for pre-order. Taking its name directly from the blog from which it was born, All Things Paper is a new book out next month that will sate even the most discriminating paper art tastes. Read more about All Things Paper -- in print! We've kept the runners up from this month on the list (Chesapeake Bay, Penobscot Bay, and the Great Salt Lake), and added newcomers Lake Tahoe and the Florida Keys to the mix. And here they are! 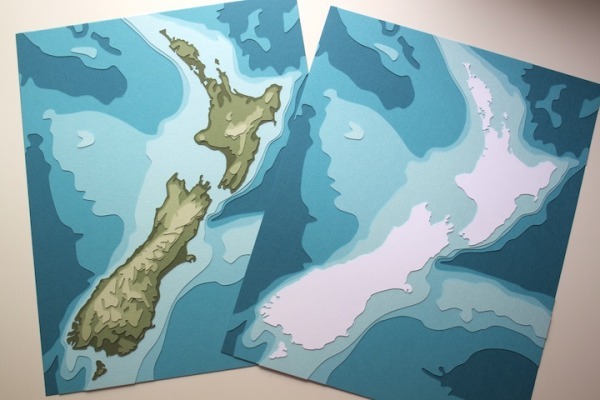 Not one but two New Zealands at your fingertips. 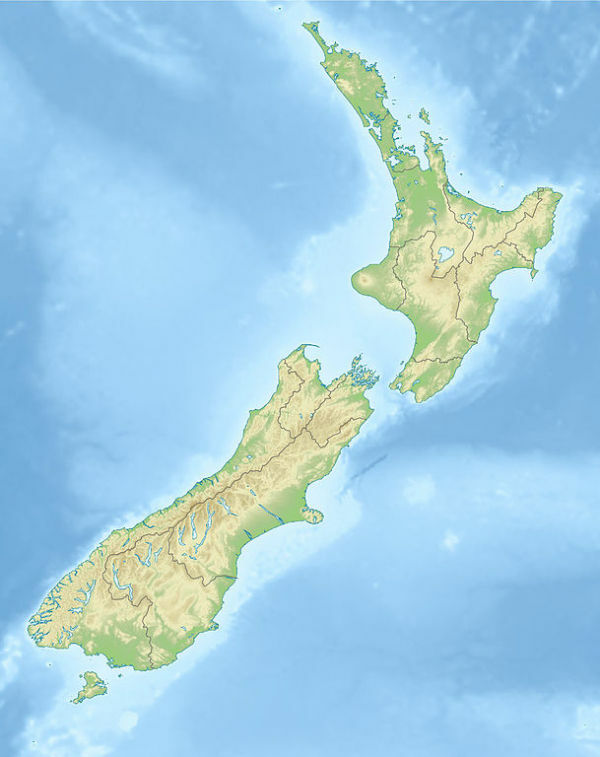 Read more about New New Zealands! It's New Zealand with 50% of the total votes! I'm looking forward to carving out these beautiful islands and having pieces available for YOU in the shop within the week. Here's a few shots of my latest custom piece. 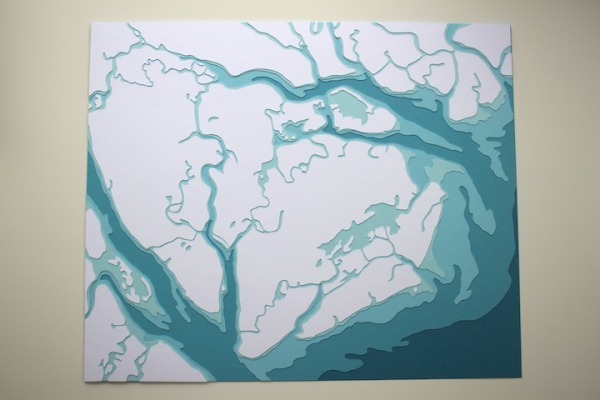 It features St. Helena Island including the towns of Port Royal and Beaufort, South Carolina. On the Walls and in the Blogs! I follow a handful of decorating, design and how-to blogs in my feeds, so it was a delight to spy my work hanging on the wall of a home featured today on Apartment Therapy's blog. Read more about On the Walls and in the Blogs! Hey! It's nearly that time again! 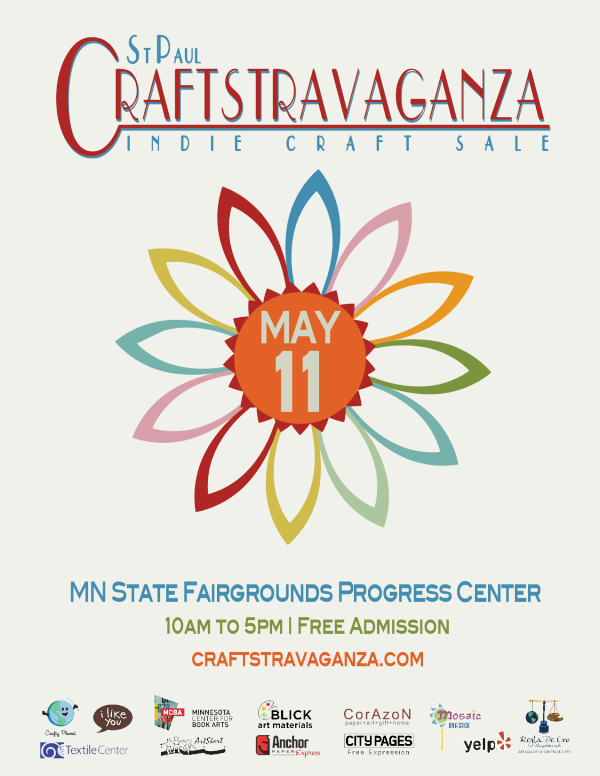 No, Beastie Boys, not time to get ill; it's time to get ready for the 2013 St. Paul Craftstravaganza.